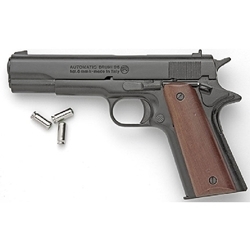 This product is our M1911 Improved .45 Government Automatic Blank Firing Pistol. The .45 Automatic was the historic sidearm of the American soldier for nearly 80 years. This blank firing gun is your chance to experience a bit of history. The clip removes to load 7 extra loud blanks 8 millimeter. The blued finish, wood grips, and loud blank firing action give the shooter a realistic feel. This is an ideal blank gun for theatrical, movie, or reenactment purposes. Cannot be shipped to CA, KS, CT, MA, WI, MN, NY, PR. Cannot be shipped outside of the USA.